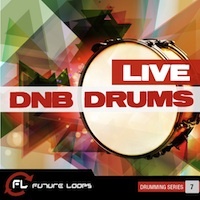 Loopmasters proudly present our next Artist Series collection with another killer producer of the Drum and Bass Scene Zero T Drum & Bass Footprints. 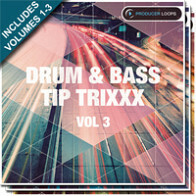 Packed with Fat Breaks, Moody Basses and Dramatic Musical Loops Zero T has produced a monster pack of copyright free samples characterised with his signature sound that will surely inspire producers worldwide, containing enough creative content to roll your own Drum & Bass Anthem and should be considered an essential addition for any modern Producers toolkit. 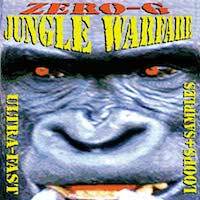 In late '99, just as Zero T's vinyl debut was dropping on Bassbin001, the Mercury/Mobo award winners 4 Hero snapped up some tracks that he and new cohort Beta 2 had done. This led to an EP and a 12" on Reinforced, the daddy of all DnB labels and not a bad start at all. Soon Zero T and Beta2 were getting to meet the likes of Klute, Fabio, Total Science, Goldie, Digital, Bailey, Flight, Storm, Doc Scott and so on. By 2001 releases were coming thick and fast on labels like Subtitles, Commercial Suicide, Function and Advanced...A noteworthy breakthrough was had with Zero T's remix of disco classic ' Spread Love ' by Lenny Fontana which appeared on the seminal Plastic Surgery series on Hospital Records. 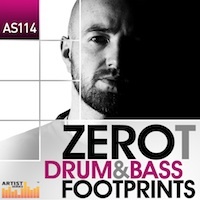 Collaborations and releases with Drum and Bass Legends and labels such as Calibre Bryan G and Jumping Jack Frost's V Recordings Camp, Artificial Intelligence's Integral Records, Total Science's CIA imprint, Shogun Audio kept Zero T busy and in demand, so in 2010 Zero T launched his own label "Footprints" as a platform not only for his own music but other artists so far including Calibre, ST Files, Mark System, Need For Mirrors, Beta 2 and UK band All Thieves. A major coup was had in June 2010 when he mixed and compiled FABRICLIVE52 for the esteemed London venue/label. 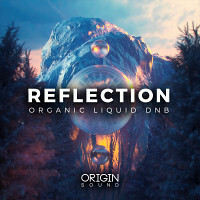 Covering not just the spectrum of DnB, but a sprinkle of Dubstep, Garage, House and Techno in there too, all exclusively sourced from the producers themselves. 2012 saw a number of Zero T releases including the widely rotated Roxy Music EP for Dispatch Records and pair of tracks for Total Science's CIA; Red Hand and Stolen Moments (in collaboration with Riya). He has also been back on remixing duties for Stray/Warm Communications/CIA/Total Science/Kolectiv/IM:Ltd and Lifestyle Recordings, while the Footprints Brand has gone from strength to strength with 12"s from Calibre, Nickbee and Zero T + Beta 2. Expect to find 817Mb of 24Bit 44.1 KHz sounds and samples such as Growling Basses, Crisp Fresh Drum Loops, Sinister Synths and more. In Detail 817Mb of 24Bit 44.1 KHz of content including 56 Bass Loops, 52 Drum Loops, 50 Music Loops, 82 Drum Hits, 10 Bass Multi Sampled Instruments, 5 Lead Multi Sampled Instruments, 5 Pad Multi Sampled Instruments, 5 String Multi Sampled Instruments, 20 SFX, 170 Rex2 Files and 41 Soft Sampler Presets for Kontakt, Halion, Exs24 and Sfz Formats. The pack is also available in Apple Loops, Ableton Live Pack and Reason Refill to purchase separately. 2013 will see the debut LP on Footprints in the form of a compilation LP put together by the man himself, featuring tracks from himself and his favourite artists on the scene, both old and new! Also watch out for Pop Productions for the likes of Calvin Harris Vocalist Ayah Marar (track: Lethal Dose) amongst other non D & B Projects. Loopmasters Artist series goes from strength to strength and as always we offer you a chance to sample from true heroes of their genres, so check out the demos and discover Zero T Drum & Bass Footprints TODAY! - Reason Refill format includes Wav and Rex2 Loops - all single (non looping) sounds and Sampler Patches NNXT and Kong. Comes as a .rfl compressed file only for use within Propellerheads Reason. - 41 Soft Sampler Presets for Kontakt, Halion, Exs24 and Sfz Formats. - The pack is also available in Apple Loops, Ableton Live Pack and Reason Refill to purchase separately. The Following End User License Agreement is included with Zero-T - Drum & Bass Footprints. This License is only valid for the individual who has purchased an unopened, new and lawfully made copy of Zero-T - Drum & Bass Footprints from a dealer or distributor authorized by Big Fish Audio. "All Rights not expressly granted to the user are reserved. 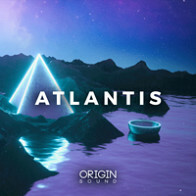 The sound samples in this sample pack are licensed, not sold, to you to be reproduced within your original musical compositions only. All copying, lending, duplicating, re-selling or trading of this product or its content is strictly prohibited. Only the original purchaser of this product has the right to embody and reproduce the enclosed sound samples within their music compositions. The Licensee may use the Sounds in combination with other sounds in music productions (which include soundtracks of such as films, video productions, radio/TV programs or commercials, computer games and multimedia presentations, library music), public performances, and other reasonable musical purposes within musical compositions.The Licensee MAY NOT use the Sounds in isolation as sound effects (i.e. a sequence of musical events) or within any competitive products that are sold or relicensed to multiple third parties. In these scenarios the Licensee must arrange an extension with Loopmasters Limited. This license is granted for a single user only (and is given on a worldwide basis). The license is non-exclusive and is granted for the full period of copyright protection and sound samples. You cannot electronically transfer the sound samples or place them in a time -sharing or service bureau operation or a computer/sampler network. Opening or using this product constitutes your acceptance of these terms."